A while back I read this author’s first book entitled “Still Alice” and absolutely loved it. That book was about a woman who developed early-onset Alzheimer’s Disease. Alice was a loveable main character. This book was about a 37 year old woman who was in a car accident and incurred brain damage which left her pretty much unaware of her left side. Unlike Alice, this main character, “Sarah”, was not particularly loveable. In fact, I didn’t like this woman AT ALL through the first two-thirds of the book. I didn’t even feel sorry for her when she got into “the big accident”. Why? Well, she was SO into herself and her high-powered job that she really had little time for her three kids or her husband. Maybe it’s just me. I think that having a job is great (obviously, as I’ve had one for all of my adult life) but I also place more importance on family than this woman did. 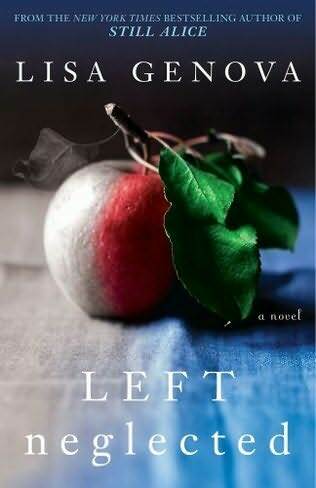 That aside, it WAS interesting to learn about the real neurological condition of “left neglect”. People really DO suffer from right-sided brain damage that leaves them unaware of anything on their left side. Medically, this was a very interesting book! Towards the end, I began to like Sarah more. She struggled with her disability, learned to love her family more, and faced hard decisions with more than the “how would that affect my job” mentality. I listened to this book on CD and thought the reader was excellent. I will most certainly read more by Lisa Genova in the future! She certainly writes an intelligent novel, well based on fact. I agree with you when you said “She(lisa genova) certainly writes an intelligent novel, well based on fact.” however, I disagree with you in regard to your stance on family life. I think the woman in the novel did what she had to do to take care of her family. Maybe Elaine Charles will ask her about all of this, this weekend on the book report. Im pretty sure that Lisa Genova is the featured guest this weekend. Hi there Booklover, nice to hear your opinion on this book. In regards to “Sarah” in the novel doing what she had to do to care for her family, I still disagree. Nobody “needs” to live in the snazziest and most expensive neighborhood in the greater Boston area. Nobody “needs” to have a vacation home in Vermont. Their choice of “lifestyle” became more important than everyday family life. Personally, I can’t admire that. But then, that’s just me.